Facilities Director, Ann Coyle Degnan was tasked with researching and deploying a standardized security management system throughout LBSD’s 10 schools and one administrative building. 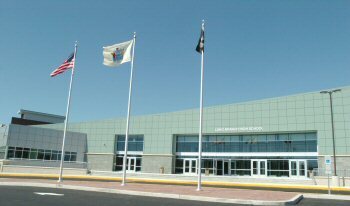 Long Branch School District (LBSD), Superintendent of Schools, Joseph M. Ferraina’s “children first” philosophy has driven LBSD in New Jersey to construct four new schools and renovate others. Today’s volatile society, along with after hours school building demands by the public, require school districts to secure not only their students, but their staff, properties and numerous visitors. After reviewing several systems, Advanced Video Surveillance recommended AMAG Technology’s Symmetry Professional access control system and Symmetry Video for a complete security management system. Seven buildings now have Symmetry Professional installed and six of those have implemented Symmetry Video. All staff is required to wear badges. High School and Middle School students carry an ID badge, but it is not an access card. Once LBSD started expanding to accommodate the needs of its 5,000 students and staff, they realized they could do so much more in terms of security. They wanted to monitor student traffic flow, view schools remotely and implement a staggered dismissal. They wanted one set of security rules for all schools to follow. Ferraina feels that security is a big concern. Cameras provide a lot of information to help resolve issues. LBSD takes an interactive approach to protect its schools. Rather than having a guard view monitors, a security officer roams the hallways throughout the day and interacts with the students. The security people are physically monitoring what is happening, and if there is an incident, they radio back using handheld radios to the office staff who immediately view the monitors. Security officers are stationed at different areas throughout the building. In the morning, they are outside watching over the students. The high school finds it helpful to monitor traffic and student behavior outside. They don’t hesitate to review video if there is an incident. They like to keep an eye on their students. The new high school and middle school use Symmetry Video as a live tool to help deter unwanted security breaches and bad behavior. The elementary school uses video as a forensic tool. Having just opened their new high school, students and staff are transitioning to the new building. High school administrators don’t know where all the hiding places are, and therefore added security officers to help them learn as they go and where additional cameras should be placed. Symmetry manages access after school hours. Prior to installing the Symmetry Security Management System, LBSD relied on janitors to lock doors at appropriate times to manage access in designated areas. Now, the necessary doors are scheduled to lock at a specific time. Automatically locking doors forces people to remain in designated areas where an event is occurring. The Board Office administration building houses Symmetry’s main server and cameras monitor the exterior. In addition to securing administrative offices and staff, Symmetry protects the district’s daycare center, Hand in Hand. The daycare center is utilized by student mother’s who drop off their children and then are bussed to their school. Symmetry Video helped the police identify two suspects who removed items from the middle school and high school building sites. The system also helps track employee activity. If an employee is in a building late at night, Symmetry Video can track the employee’s whereabouts. It eliminates the need to pursue certain issues because you can see who was in the building. The Symmetry Security Management System controls access so well, that only two people have keys to all the doors for all buildings, severely reducing the chance for keys to get into the wrong hands. The system, however, is set up so others do have an interior master key. This allows LBSD to properly administer access rights to appropriate individuals without compromising security. The Symmetry Security Management system allows the schools to manage their own database. Having multiple schools on the system, LBSD needed centralized control for each building. Symmetry provides the ability to separate the database so the principal of the high school only sees the high school badge holders. The principal can manage his/her own database. If a cardholder belongs in multiple schools, then the card is issued that way. LBSD runs a web client which allows principals at different schools to log in and modify badges and access level permissions for their perspective schools. This provides a lot of flexibility if the principal needs to conduct changes from home or an alternative location. The IT department runs Symmetry Professional on a laptop and is considered a strategic command center in the event of an emergency. Running Symmetry on a laptop with wireless capability allows administration to act quickly if necessary. In the event of an emergency, Ferraina or the administrator in charge can take the laptop outside and view the location of staff and students. The laptop also allows administration to view the school in crisis, providing an opportunity to take immediate action. Advanced Video Surveillance is a highend security systems design and integration company that services high profile clients throughout the New York and New Jersey area. Their extensive experience with AMAG’s Symmetry Security Management System, Symmetry Video system and understanding the demanding needs of LBSD made them the perfect integrator to install the system into LBSD. LBSD conducted a comprehensive security drill at the middle school. The police were impressed with what they could see on the monitors. Sitting in a trailer during the drill, the police and administrators could see where the kids evacuated and that it was done properly. There was a large amount of information to view. The cameras allowed administrators to watch several aspects of the building instead of the one spot they were stationed too.